Mention the phrase “Russian-made” and it conjures up images of Soviet design — generally not thought to be the most elegant. 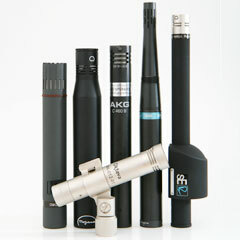 In the context of microphones, it usually means bulky, grey tubes that look like submarines rather than precision instruments for capturing sound. Despite the lack of glamor normally reserved for European microphones, Russian microphones have gained fans in the west. It’s because I count myself among those fans that I was intrigued when I saw a line of studio condensers from Nevaton at the NAMM show several years ago. Lonya Nenashev of Red Square Audio gave me a guided tour of the booth that day and discussed the lineup with me. The designs were a clear departure from the stereotypical Soviet style and looked more like specimens you’d normally expect to see coming from Germany. I made a mental note hit up Lonya for a couple of review units to feature on the “Sessions with Slau” podcast but unfortunately never followed through. When Matt McGlynn asked if I would be interested in checking out a few Nevaton mics for Recording Hacks, I welcomed the opportunity to give them a whirl. While I had been overseas, I did a little research on Nevaton and learned that the company is a direct descendant of LOMO, the famed Russian microphone manufacturer with roots dating back to 1947. Upon returning from an orchestral gig in Kiev, I arrived to find a box of Russian beauties at the studio. Although I knew I had several weeks of editing and mixing in front of me and that I wouldn’t really have a chance to use the mics for some time, I just had to open the box and see what they had sent. What I found were several mics that seemed almost like they had arrived from Berlin rather than St. Petersburg: the MCE400 miniature microphone, the MC49-O small diaphragm omni, the MC416 multipattern large diaphragm and the MC404 dual diaphragm stereo condenser. The presentation of each mic was simple and elegant and once again I was impressed by Nevaton’s design choices. Rather than looking like a collection of spare tank parts, these mics had a refined appearance one would expect from serious studio microphones. OK, let me be completely honest: I’ve never been particularly excited about miniature omni condensers. I mean, they have their special applications like clip-on mics for interviews and discreet miking of instruments on stage. In the studio, however, I’ve had little use for them so I can’t say I was especially interested in the MCE400 — that is, at first. 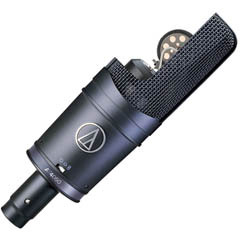 I initially plugged it in alongside a Countryman B3 and an Audio-Technica PRO 70 and was immediately struck by the significantly higher output the MCE400 had as compared with the other mics. Eyebrow slightly raised, I proceeded to try the MCE400 on several musical sources, something I wouldn’t normally do in the studio with a miniature mic. Using either of the two supplied mounting clips, I was able to easily attach it to acoustic guitar, mandolin, banjo and violin. The sound was surprisingly even and well-rounded. While the MCE400 might not have transformed me into someone who would reach for a miniature mic over a small diaphragm for instrument miking, it sure did impress me with its big sound for such a small package. The MCE400 ships in a compact plastic case that holds its various accessories and retails for $399 ($299 street). Having delayed gratification long enough, the next microphone I checked out was the MC49-O omni condenser. Actually, as luck would have it, there was a matched pair of them in the box for me to try. I remembered hearing some nice things about the MC49-C (its cardioid predecessor) in a Tape Op article some time ago but never had a chance to use one so I was curious to see what the MC49-O had to offer. I tried it on a few instruments including a Taylor 420, a Wechter Nashville elite, a 100-year-old Gibson “Plain A” mandolin and a beautiful Iorio accordion. For my own comparison, I set up the MC49-O alongside a Schoeps CMC 6 with an MK 5 omni capsule. Because I never intended for this to be a shootout, per se, I wan’t get into a lengthy comparison between the two mics. Let me just say that, with the Schoeps, I’m confident with its performance and can get fantastic results. When I heard the MC49-O along with the CMC6, it was, as far as I’m concerned, on par with the Schoeps. The MC49-O includes a high-pass filter, a phantom power LED indicator and features internal elastic suspension. While I found its elastic suspension to be helpful in cutting down some noise from vibration, for critical studio recording, I’d still recommend using a proper shock mount. 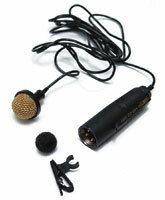 By the way, Nevaton’s documentation clearly aims one of the microphone’s applications for use on stage. Its elastic suspension would surely be useful in such a situation where standard shock mounts are not likely to be used. 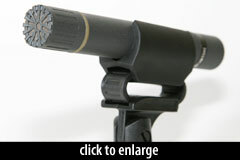 Further, the microphone has a matte finish which yields a low profile in sound reinforcement scenarios. The MC49-O MSRP is $1,199 ($899 street) each and $2,399 ($1,799 street) for a stereo pair and, at that price point, it’s most definitely considered a premium microphone but it performs like microphones that some might consider a cut above. I know it’s the kind of thing one normally hears about budget mics — that they perform just as well if not better than microphones many times their price. It’s a cliché of the microphone world, for sure, and I sometimes have to laugh at how often this accolade is bestowed. When I heard the MC49-O, I felt that such a claim of performance beyond price point was truly deserved. I won’t wait until the end of this review to tell you that my favorite microphone in the lineup was the MC416. This large diaphragm condenser features four patterns (omni, cardioid, wide cardioid and figure-8) in a transformerless, lollipop design. The polar patterns and 10 dB pad are engaged via two circular switches at the base of the capsule head. I must say, whenever I encounter this design, I can’t help but compare it to the legendary UM-70 from Microtech Gefell. Although the UM-70 does have a transformer, there’s a transformerless version as well (the UMT-70) but I couldn’t get my hands on one for comparison. Instead, I used the closest thing I could find, which was an AKG C 414 B-XLS. I put the mics up to try out some vocals. The first mic I plugged in was the MC416 and I initially thought I had made a mistake because I didn’t hear any inherent noise. Normally, when turning up the gain, I’d at least be able to detect at least some sound from the mic. I decided to go back out to the live room and troubleshoot things while wearing a pair of headphones. As soon as I put on the cans, I heard the crisp, clear sound of my voice saying, “What the…?” Everything was, in fact, connected and working fine. With its 14 dBA equivalent noise, the MC416 had an unexpectedly low noise floor. I guess maybe I should read the specs before I plug in the mics, eh? Anyway, while I did eventually bring up the AKG C 414, I might as well have not because, for the rest of the time, I pretty much ignored it. On vocals, the MC416 sounded marvelous — just one of those situations where you’re almost distracted by how good it sounds. Well, perhaps because I was in evaluation mode, it almost seemed distracting to me because I frankly didn’t expect to be so impressed. For what it’s worth, my experience with Russian microphones, while favorable, had never been particularly great. The MC416 changed that for me. I quickly decided that I had to try it on piano which, for me, is a great test for an LDC. I put the MC416 into omni mode and positioned it just inside the case of a Yamaha C3 grand piano. Almost as an afterthought, I also included the C 414. 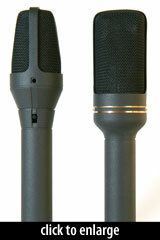 Both mics sounded great but the MC416, to my ears, had a little more definition in the low end. Now, that might be irrelevant for pop and rock but for solo piano or small combo stuff, I’m sure I would’ve chosen the MC416 as my preferred tool for the job. I did try the MC416 on a few other sources like acoustic guitar, classical guitar, bandura (a 60-string cross between a lute and a harp), percussion and acoustic bass and it performed wonderfully. Frankly, after the guitars, I didn’t even bother putting up the C 414 because it practically felt like an unfair comparison. There was nothing that the C 414 had over the MC416 and I preferred simply to enjoy listening to the MC416 at work. Retailing at $1,649 ($1,199 street), the MC416 is certainly not among the less expensive multi-pattern LDCs but it’s most definitely not as expensive as some of its comrades. Let’s face it, on one hand, it’s difficult to compete with legendary European microphones because of their reputation and, on the other hand, it’s difficult to compete with Asian microphones for their price. One thing to consider is that these microphones’ parts are all manufactured in-house, assembled by hand and fine tuned by a team of highly experienced technicians — certainly not products of an assembly line and more like precision instruments coming out of Germany. 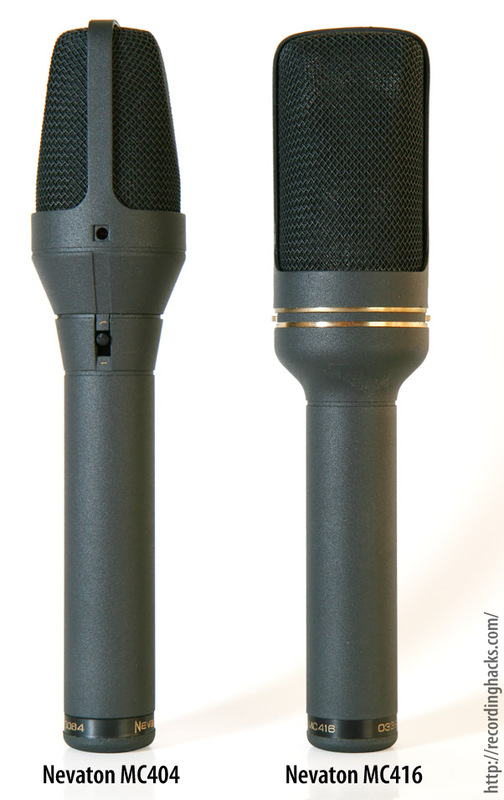 The MC404 is is described as a stereo microphone with a fixed 180 degree offset between the two capsules. To be honest, I had never previously used a stereo mic capable of 180 degree width. I was skeptical of the MC404’s capabilities to accurately represent the center image, given that each capsule would be facing the source at 90 degrees off-axis. I decided to use it as a backup stereo mic for a remote live recording at a classical concert. I positioned it high above the stage on a Latchlake Mic King behind a pair of Schoeps CMC6s with MK 2 capsules. Of course, this wouldn’t be an apples-to-apples comparison given the MK 2s’ cardioid pattern but it was a good opportunity to see how the MC404 would perform in a large space with plenty of stereo ambience, a few musicians as well as a soloist center stage. Under the pressure of a live recording gig, I didn’t pay too much attention to the sound of the MC404 during the concert. I just took the mic levels and we were off. When I got back to the studio the following day, I had a chance to listen to the results. Of course, as compared with the cardioid pair, the MC404 captured much more of the hall but it certainly didn’t lack anything in its center image. The soloists always came through with nice definition and clarity. Normally, if I were to choose something other than a SDCs for stereo overheads in a large ensemble setting, I’d probably throw a pair of LDCs up in a 90 degree X-Y configuration. If the space were nice enough, I might use an ambient pair at the back of the room. With the MC404, I sort of managed to get both the performance and the room all in one. Naturally, the source and ambience are inseparable in such a case so, had I been using only the MC404, I would have taken some extra time to make sure the position was right for the kind of balance I desired. In this case, I happened to luck out and, after all, it was just a second microphone for backup purposes. For what it’s worth, I wanted to compare the MC404 to another similar microphone but had a bit of difficulty locating a stereo mic with a full 180 degree offset. I eventually managed to land a Sanken Microphone Company, Ltd. CUW-180, a stereo LDC with an adjustable offset up to a full 180 degrees. After trying the two mics on a few sources, including grand piano, classical guitar and acoustic steel string, I realized that I essentially couldn’t hear a difference between the mics. That is, they weren’t identical but there was nothing specific about either mic that I could reliably identify each time. It was only after very close listening that I managed to pick out the MC404 each time and that was because of its low noise. With a 12 dBA equivalent noise floor, it was perceivably quieter than the CUW-180. Really, though, I was splitting hairs at that point. The MC404 has an MSRP of $1599 ($1099 street). It comes with a 5-pin to dual 3-pin XLR adapter and, like the MC416 and MC49-O, ships with a wooden box and a microphone clip. So, it seems as though I’ve had nothing bad to say about these mics, right? Well, before I throw in a bit of criticism, let me say that I feel that these mics (especially the small and large diaphragm condensers) are of exceptional quality. They truly seem to be on par with micas that sell for considerably more. While price should never be the measure of a microphone, it can certainly be the measure of a great deal and, at the current street price, these mics are a great deal. I’m simply not a fan of rubber mic clips that are pseudo shock mounts. I mean, it’s nice that manufacturers supply them because we all know how easily they can be lost or broken. Still, they’re not terribly impressive. With the Nevaton mics, the clips seem to be thrown in as an afterthought, hanging unceremoniously outside the box. OK, I suppose these kinds of clips are perhaps not deserving of a spot of their own inside the wooden cases. Still, it seemed incongruous to have such wonderful specimens inside a jewelers box without integrated shock mounts or custom clips. Yes, it’s a very minor point and I feel funny even bringing it up. Given the dimensions of the mic bodies, I could probably find 10 different shock mounts in the mic closet that would fit these microphones easily so I’ll just stop complaining right now. At a time when Asian microphone offerings are tempting, if only for their price, anyone looking for high quality without the high price should definitely consider the products that Nevaton has to offer. True, they’re not so easily procured at a local big box music retailer but perhaps that’s not a bad thing after all. 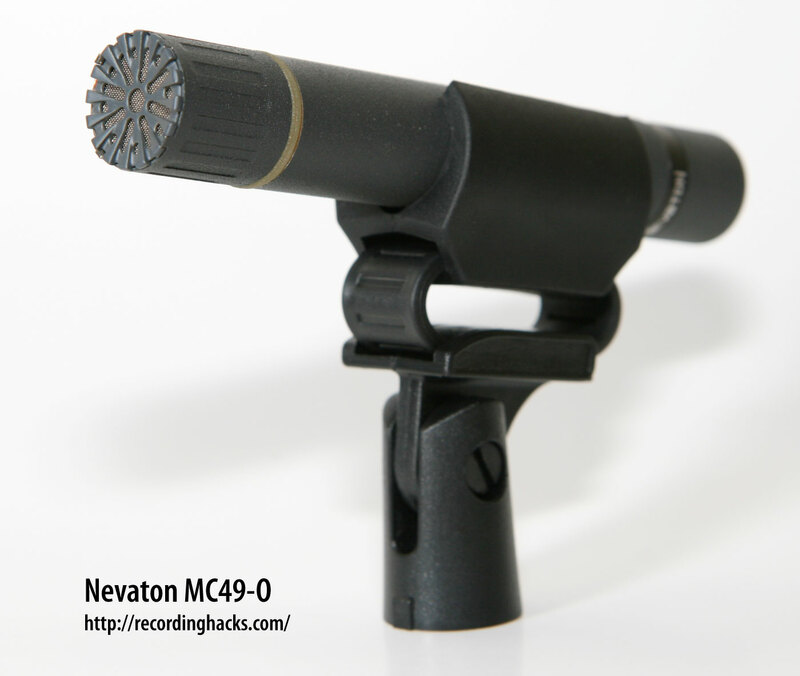 Find more information about Nevaton microphones. These sound like great mics I will definitely give them a try. I don’t find a lot of affordable mice that compare to the Schoeps, very impressive. I had the pleasure of trying the MC 51’s by Nevaton this weekend. Very impressed by the tight mids and smooth top end (very similar to top Euro mics). It dealt well with vocals, low tom and even trumpet which can be harsh through many LDC’s. Definitely impressed with Nevaton. After playing a Sovtek amp and Big Muff for years, this is the best Russian Gear I have used.